American parents say their children are picking up British accents after watching the popular children's TV show Peppa Pig. 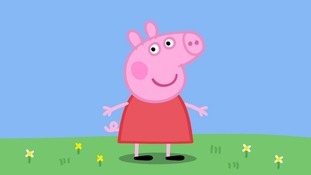 The cartoon follows the life of Peppa and her family in a UK fictional town made up of various animal families. Toddlers across the world are now tuning in to see Peppa's latest adventures, and it appears Peppa's southern British accent and vocabulary are rubbing off on those watching the show. Parents have shared their concerns on social media, with many blaming the TV show for causing a change in the way their children talk. A mother in Kansas City shared a video on social media of her three-year-old son Oliver who started to speak in a British accent "pretty quickly". Molly Smalley said her son "started doing it pretty quickly out of nowhere when he started watching Peppa Pig." She added: "We think it's really funny! He will still do it." YouTuber Casey Neistat wrote on Twitter: "My three year old daughter speaks with a slight but pronounced British accent. She learned it from Peppa Pig." Paul La Monica writes: "My youngest son has recently become obsessed with Peppa Pig and have even adopted a fake British accent." Mike Lupa asks: "Anyone else's kids developing a slight British accent after watching Peppa pig? She is also snorting like a piggy, but that is expected." Leah Wachner said: "My three year old says 'tomatoes' with a British accent." "The most entertaining aspect of my life right now is that my toddler has been watching Peppa Pig and now speaks with a British accent," said Jess Steinbrenner. The "Peppa Effect" was first reported on the parenting blog Romper.